Truly Yogurt has long been a local favorite here in Wellesley, Massachusetts. Summer or winter, sunshine or storm, Truly’s always has some customers strolling in for some ice cream or frozen yogurt, from Dana Hall especially. 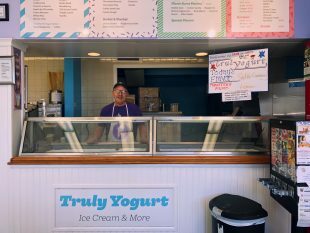 It doesn’t matter what kind of day it is, the dedication to Truly’s from the townspeople of Wellesley, and beyond, means there will always be at least someone stopping by to get a scoop and catch up with Gary Goldman, owner of Truly Yogurt. Seeing as Truly’s was opened by Mr. Goldman nearly 30 years ago in 1992, it’s clear the establishment is thriving. What really keeps people coming back, however, isn’t just the ice cream (though, it is certainly a plus) no, what really makes Truly’s special is Gary Goldman. Since he opened the store, Mr. Goldman has been cultivating relationships with customers and the greater community. He told me about the work that goes into maintaining a small business, and how it can work to find success. Whether there’s an event down at Honeywell, or fair at Wellesley College, Mr. Goldman always looking for ways to give back to the community. And in turn, customers remain fiercely loyal, especially if a new yogurt place pops up down the street. Not only that, but Mr. Goldman’s just an all around upstanding man. He’s kind, always talking to customers. The atmosphere of the restaurant is like no other; just comfortable. And that is what makes really Truly’s stand apart from other chain ice cream shops in the area. Besides the fact that its ice cream is (arguably) way better, it’s easy to feel that sense of community in a place that’s willing to build that bridge between them and the town around them. Truly’s isn’t just another chain store; at this point, it’s part of Wellesley’s culture, its identity even. Wellesley wouldn’t be Wellesley without Truly Yogurt, and Truly’s wouldn’t be Truly’s without Gary Goldman.